Dr. Meri Cummings, lab manager and science resource teacher at the Center for Educational Technologies at Wheeling Jesuit University, received the Outstanding Commitment Award at the 2012 West Virginia FIRST LEGO League state robotics tournament held Dec. 8 in Fairmont. The award was signed by inventor Dean Kamen, who founded FIRST (For Inspiration and Recognition of Science and Technology) to inspire young people's interest and participation in science and technology. More than 48,000 children participate in FIRST LEGO League, a partnership between FIRST and the LEGO Company. Cummings served as West Virginia tournament director for seven years before finally stepping aside in 2012 to emcee the tournament. Under her leadership the tournament grew incredibly as she spreads the word on LEGO robotics through her work at the NASA-sponsored Classroom of the Future program. 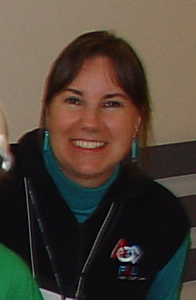 Cummings writes a blog and manages four collaboratives on robotics on the NASATalk website operated by the Classroom of the Future. The 2012 tournament saw 54 teams participate, the most ever.